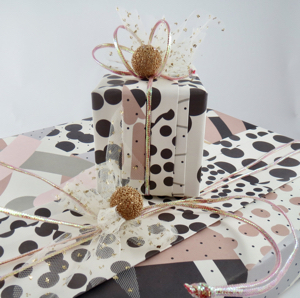 Among my top 5 fave finds at Top Drawer 2019 was giftwrap designed by Katie Leamon. How great that you can mix and match the designs and not waste a single scrap of paper. My invaluable cheat pleat using her scatter polka wrap, while blending in perfectly, enabled me to secretly extend the length of paper to go around the present!